Container Gardening Ideas: Shopping Cart Used as a Salad Planter! The next time you shop for salad at a supermarket, think again. Could you grow your own lettuce? We already grow ours here at Container Gardening For You. It's lovely to go out and pick salad fresh from a pot or raised bed. We also hate the fact that our local IGA charges FIVE DOLLARS for 143g of organic lettuce! (Absolute crooks.) The same money buys seedlings that will give us salad for months if looked after properly. Still, it would never have occurred to us to get our own back by "borrowing" one of the shopping carts, filling it with soil and using it as a salad planter. You have to admire the poetry of that justice. Very nice work! I love the detail of growing stuff out of the side as well as the top. Tee hee. Please use the Comments form at the bottom of the page to leave your feedback about this wiry-sided planter idea, or click the arrows to see more unusual container gardening planters, including toilets, garbage cans, paint cans, and a tree stump! 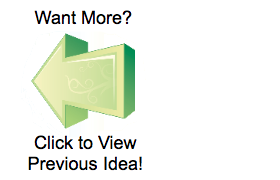 Use these buttons to get inspired by more bizarre and funny container choices! Read our article on recycled container ideas, and find out all the crazy things people grow their flowers in! 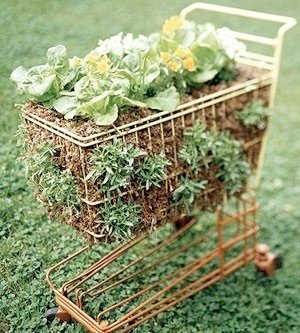 Comments for Container Gardening Ideas: Shopping Cart Used as a Salad Planter! I love the shopping cart idea, but I'd use straw bales inside instead of the amount of soil required to fill a shopping cart! A straw bale is about a perfect size to slide right in & costs about $3.50 US. I'm sure that much soil would be far more. 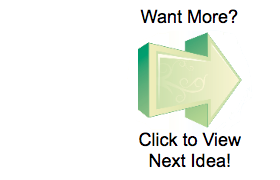 You can find out how to grow just about anything in straw bales all over the web. I'm Disabled so I use straw bales all over my veggie garden, but to grab a shopping cart from my local grocery store & elevate it even more would be wonderful on my back!! Plus, I could literally cover the entire thing in flowers & it would be beautiful!!!. Join in and write your own page! It's easy to do. How? Simply click here to return to Container Gardening Ideas.